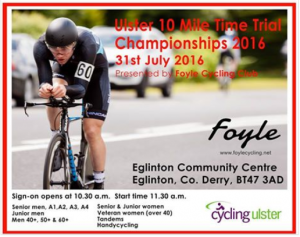 After successfully hosting their Grand Prix on 17 July in Killea, where almost 175 riders took part across all disciplines, Foyle Cycling Club now host the next round of the 2016 Ulster 10 Mile Time Trial Championships on Sunday 31 July, in Eglinton, County Derry. Riders from clubs in Antrim, Derry, Donegal and Down have already signed up, and categories are as follows: Senior women; Junior women; Veteran women (over 40); Senior men, A1,A2, A3, A4; Junior men; Men 40/ 50/60. ‘We’re hoping for a great turnout on the day,’ Foyle Cycling Club PRO Ronan Gallagher said. He continued: ‘the course at Eglinton is a great route and known well to many of the riders`. Sign on via Entry Central or on the day at 10.30 in the local community hall in Eglinton, with the first race due to commence at 11.30. For more information go tohttp://www.entrycentral.com/event/104013.